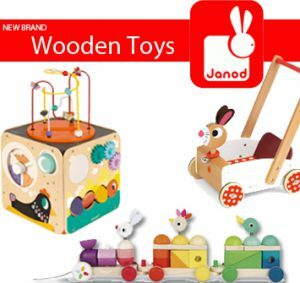 Janod is an award winning brand for the design and manufacturer of wooden toys of the highest quality. The company has a 50 year strong heritage with its origins in France from where it still operates and designs its creative line of toys in vibrant colours. 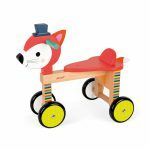 Supply is now available of this award winning wooden toy brand at trade price from wholesaler Baby Brands Direct. Janod has stayed true to its founding activities of producing wooden toys for the delight and enjoyment of children. The toys span from pull alongs to balance bikes, creating a range of products types that cater for children from 12 months to 9 years whilst also providing retailers with a selection of market price points within each category. Retailers might be particularly pleased to have access to the range of wooden activity cubes and stations that many manufacturers have struggled to produce at reasonable SRPs but with Janod specialising in wooden toys, they have been able to achieve this. The Janod ones are packed with engaging activities, fun looping games, colours and friendly faces, helping little ones with motor and co-ordination skills as well as encouraging discovery and imagination! Similarly the range of walkers is an absolute delight, there’s a DIY trolley and gorgeous doll’s pram for the best of imitation and creative play. There are also 3 ‘carts’ that are great for encouraging standing and walking and can house some of little ones toys. The ‘Tatoo’ collection trolley is a luxury offering coming with 30 learning blocks and a built in learning abacus. Also encouraging little ones to be active are the balance bikes. These are first bikes (without pedals) that help little ones to establish balance and can be used from around 18months. On one of these they are encouraged to scoot about and build up their physical strength. The styles available are simply must have including a retro scooter available in both mint and pink! The Baby Forest collection also offers 2 lines particularly ideal for Christmas, which include the beautiful rocking fawn and a ride on. All of these lines are of course manufactured in the quality expected of this heritage brand. 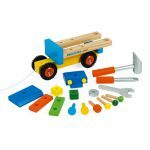 There are similar best-sellers including the vanity case and vegetables basket which are again great for creative play, learning tools and wonderful keepsakes. For the tiny hands there is the water based paint items such as the Ostrich stacker that houses a hidden baby inside(! ), the gorgeous Flamingo balance game and chunky Fox stacker, all helping with early development stages given the pieces that are the right side for those hands to grasp and interact with. There are also plenty of puzzles and games to participate in that can encourage interaction and communication. 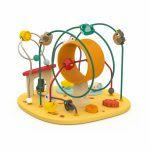 The baby forest collection offers a portable shape sorter with clock dial, and a magnet puzzle game of the characters. 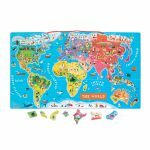 There are 4 puzzles types: cube blocks for the youngest hands that make up 6 different pictures, chunky pieces that can be played with independently or fitted into the picture tray, a large cardboard piece puzzle in a stunning panoramic jungle scene, and a finally a magnetic board puzzle of the world that helps teach continents and characteristics which can be hung on the wall (approximately 77cm by 46cm). Within this category there are also beautiful gift lines including the ‘learn to count’ and ‘learn the alphabet’ puzzles which are wonderfully creative and amusing in their illustrations and product design. Baby Brands Direct is a multi-award winning distributor of toys and nursery goods to independent retailers. All good retailers with a minimum of their own website in the industry and or physical store are welcome to register for access to an array of leading global brands at trade price and a quick dispatch service. Account holders can log in here to review the supply of toys and more available to trade.